[Ivanijus] Robbie Thank you Robbie. What are my options now? Upgrade ushahidi? Hi! I'm new to ushahidi, to work on https://github.com/ushahidi/platform-client is there any demo server available or hosting my own server is the only option? If there is a demo server can anyone help to integrate platform-client with the demo server? 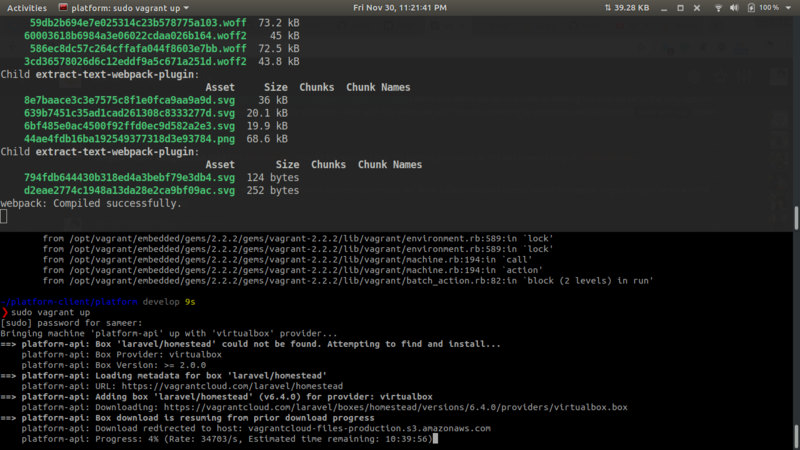 I'm not preferring to setup my own platform as vagrant up shows an estimated time of 10+ hours. I'm connect via a router. Generally I'm able to get a download speed of 50 Mbps on this connection. [Will Doran, Ushahidi] what version of vagrant are you using? [Will Doran, Ushahidi] that should be fine, can you share a screen shot of what you see when you run vagrant up? I have pointed my client at the remote api and it's working. Thank you so much!